Loose Wet avalanches form in new snow or old surface snow that is warming. Warming temperatures, strong solar radiation, or rain-on-snow make the surface snow damp or wet. As the water content increases, the snow becomes unconsolidated. They start at a point and entrain additional snow as they move down hill, and have a characteristic fan-like shape. Loose Wet avalanche, with the characteristic single starting point and fan shape. Loose Wet avalanches form at or near the snowpack surface. Like Loose Dry avalanches, most Loose Wet avalanches start on very steep slopes. 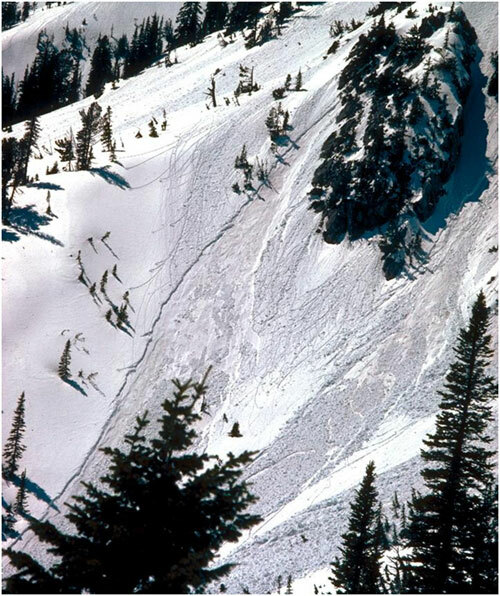 If a Loose Wet avalanche entrains a very large amount of snow, it can run long distances on low-angled terrain. They can form on any aspect. Because they are often associated with solar radiation, they are most common on sun-exposed slopes. In Colorado, Loose Wet avalanches are most likely in the late winter and early spring. 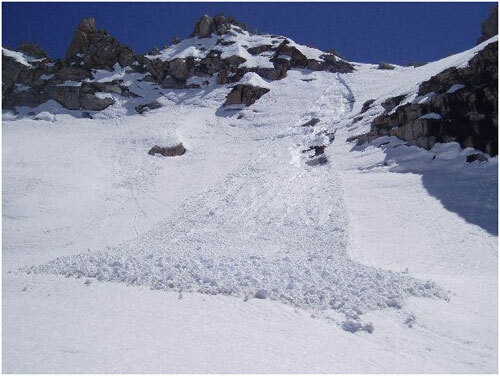 Loose Wet avalanches are usually problematic for a period of hours at a time. There may be a daily cycle, as the sun warms the snow surface and makes Loose Wet avalanches more likely. The potential for Loose Wet avalanches can increase rapidly. Because they are often associated with solar radiation, the aspects where Loose Wet avalanches are likely can change through the day as the sun moves east to west. There are many clues that Loose Wet avalanches are likely. Monitor the snowpack surface for a layer of wet, slushy snow more than several inches deep. Water may be visible between the ice grains. On small, very steep test slopes, the surface layers will slide easily. Fresh roller balls–little snowballs–falling off trees and cliff bands indicate that the snowpack surface is getting weak. Avoid steep, sunlit slopes above terrain traps, cliffs areas and long sustained steep pitches. Sluff management in extreme terrain is an effective technique for skilled riders. Travel when the snow surface is colder and stronger. Plan your trips to avoid crossing on or under very steep slopes in the afternoon. Monitor the snowpack surface, and move to colder, shadier slopes once the slush layers form.